A major new study coordinated by World Health Organization’s cancer division – the International Agency for Research on Cancer (IARC) – finds that even low-level radiation increases the risk of cancer, if exposure occurs over time. New results from a study coordinated by the International Agency for Research on Cancer (IARC), the cancer agency of the World Health Organization, show that protracted exposure to low doses of ionizing radiation increases the risk of death from solid cancers. The results, published today in The BMJ [the prestigious British Medical Journal], are based on the most powerful study to date and provide direct evidence about cancer risks after protracted exposures to low-dose ionizing radiation. A collaboration among international partners, evaluated the exposures of more than 300 000 nuclear workers in France, the United Kingdom, and the USA over a period of time between 1943 and 2005. The scientists involved in the study come from government agencies such as the U.S. National Institute for Occupational Safety and Health, Public Health England Centre for Radiation, Chemical and Environmental Hazards and the International Agency for Research on Cancer, as well as universities including the University of North Carolina, Chapel Hill and Drexel University. The study confirms – once again – what we’ve been saying for years. Even the very lowest levels of radiation are harmful to life, scientists have concluded in the Cambridge Philosophical Society’s journal Biological Reviews. Reporting the results of a wide-ranging analysis of 46 peer-reviewed studies published over the past 40 years, researchers from the University of South Carolina and the University of Paris-Sud found that variation in low-level, natural background radiation was found to have small, but highly statistically significant, negative effects on DNA as well as several measures of health. Protracted exposure to low-level radiation is associated with a significant increase in the risk of leukemia, according to a long-term study published Thursday in a U.S. research journal. The study released in the monthly Environmental Health Perspectives was based on a 20-year survey of around 110,000 workers who engaged in cleanup work related to the Chernobyl nuclear plant disaster in 1986. Scientists from the University of California, San Francisco, the U.S. National Cancer Institute and the National Research Center for Radiation Medicine in Ukraine were among those who participated in the research. Indeed, the overwhelming consensus among radiation experts is that repeated exposure to low doses of radiation can cause cancer, genetic mutations, heart disease, stroke and other serious illness (and see this.) If a government agency says anything else, it’s likely for political reasons. The top U.S. government radiation experts – like Karl Morgan, John Goffman and Arthur Tamplin – and scientific luminaries such as Ernest Sternglass and Alice Stewart, concluded that low level radiation can cause serious health effects. Hazards from low level radiation are long-term, not acute effects… Every exposure increases risk of cancer. Many studies have shown that repeated exposures to low levels of ionizing radiation from CT scans and x-rays can cause cancer. See this, this, this. this, this, this, this, this, this and this. Cumulative radon exposure is a significant risk factor for lung cancer in women. And see these studies on the health effects cumulative doses of radioactive cesium. Cumulative impacts of chronic irradiation in low doses are … important for the comprehension, assessment and prognosis of the late effects of irradiation on human beings …. The Bulletin of the Atomic Scientists[’] May-June issue carries seven articles and an editorial on the subject of low-dose radiation, a problem that has thus far defied scientific consensus but has assumed renewed importance since the meltdown of the Fukushima Daiichi reactors in Japan in March 2011. This month a guest editor, Jan Beyea [who received a PhD in nuclear physics from Columbia and has served on a number of committees at the National Research Council of the National Academies of Science] and worked on epidemiological studies at Three Mile Island, takes a hard look at the power industry. The bulletin’s Web site is generally subscription-only, but this issue can be read at no charge. Dr. Beyea challenges a concept adopted by American safety regulators about small doses of radiation. The prevailing theory is that the relationship between dose and effect is linear – that is, that if a big dose is bad for you, half that dose is half that bad, and a quarter of that dose is one-quarter as bad, and a millionth of that dose is one-millionth as bad, with no level being harmless. The idea is known as the “linear no-threshold hypothesis,’’ and while most scientists say there is no way to measure its validity at the lower end, applying it constitutes a conservative approach to public safety. Some radiation professionals disagree, arguing that there is no reason to protect against supposed effects that cannot be measured. But Dr. Beyea contends that small doses could actually be disproportionately worse. Radiation experts have formed a consensus that if a given dose of radiation delivered over a short period poses a given hazard, that hazard will be smaller if the dose is spread out. To use an imprecise analogy, if swallowing an entire bottle of aspirin at one sitting could kill you, consuming it over a few days might merely make you sick. In radiation studies, this is called a dose rate effectiveness factor. Generally, a spread-out dose is judged to be half as harmful as a dose given all at once. Dr. Beyea, however, proposes that doses spread out over time might be more dangerous than doses given all at once. [Background] He suggests two reasons: first, some effects may result from genetic damage that manifests itself only after several generations of cells have been exposed, and, second, a “bystander effect,” in which a cell absorbs radiation and seems unhurt but communicates damage to a neighboring cell, which can lead to cancer. One problem in the radiation field is that little of the data on hand addresses the problem of protracted exposure. Most of the health data used to estimate the health effects of radiation exposure comes from survivors of the Hiroshima and Nagasaki bombings of 1945. That was mostly a one-time exposure. Scientists who say that this data leads to the underestimation of radiation risks cite another problem: it does not include some people who died from radiation exposure immediately after the bombings. The notion here is that the people studied in ensuing decades to learn about the dose effect may have been stronger and healthier, which could have played a role in their survival. Still, the idea that the bomb survivor data is biased, or that stretched-out doses are more dangerous than instant ones, is a minority position among radiation scientists. Three recent epidemiologic studies suggest that the risk from protracted exposure is no lower, and in fact may be higher, than from single exposures. Conventional wisdom was upset in 2005, when an international study, which focused on a large population of exposed nuclear workers, presented results that shocked the radiation protection community—and foreshadowed a sequence of research results over the following years. It all started when epidemiologist Elaine Cardis and 46 colleagues surveyed some 400,000 nuclear workers from 15 countries in North America, Europe, and Asia—workers who had experienced chronic exposures, with doses measured on radiation badges (Cardis et al., 2005). This study revealed a higher incidence for protracted exposure than found in the atomic-bomb data, representing a dramatic contradiction to expectations based on expert opinion. A second major occupational study appeared a few years later, delivering another blow to the theory that protracted doses were not so bad. This 2009 report looked at 175,000 radiation workers in the United Kingdom …. After the UK update was published, scientists combined results from 12 post-2002 occupational studies, including the two mentioned above, concluding that protracted radiation was 20 percent more effective in increasing cancer rates than acute exposures (Jacob et al., 2009). The study’s authors saw this result as a challenge to the cancer-risk values currently assumed for occupational radiation exposures. That is, they wrote that the radiation risk values used for workers should be increased over the atomic-bomb-derived values, not lowered by a factor of two or more. In 2007, one study—the first of its size—looked at low-dose radiation risk in a large, chronically exposed civilian population; among the epidemiological community, this data set is known as the “Techa River cohort.” From 1949 to 1956 in the Soviet Union, while the Mayak weapons complex dumped some 76 million cubic meters of radioactive waste water into the river, approximately 30,000 of the off-site population—from some 40 villages along the river—were exposed to chronic releases of radiation; residual contamination on riverbanks still produced doses for years after 1956. Here was a study of citizens exposed to radiation much like that which would be experienced following a reactor accident. About 17,000 members of the cohort have been studied in an international effort (Krestinina et al., 2007), largely funded by the US Energy Department; and to many in the department, this study was meant to definitively prove that protracted exposures were low in risk. The results were unexpected. The slope of the LNT fit turned out to be higher than predicted by the atomic-bomb data, providing additional evidence that protracted exposure does not reduce risk. In a 2012 study on atomic-bomb survivor mortality data (Ozasa et al., 2012), low-dose analysis revealed unexpectedly strong evidence for the applicability of the supralinear theory. From 1950 to 2003, more than 80,000 people studied revealed high risks per unit dose in the low-dose range, from 0.01 to 0.1 Sv. “Epigenetics” is a term integral to fetal origins of disease, referring to chemical attachments to genes that turn them on or off inappropriately and have impacts functionally similar to broken genetic bonds. Epigenetic changes can be caused by unimaginably small doses – parts per trillion – be it chemicals, air pollution, cigarette smoke or radiation. Furthermore, these epigenetic changes can occur within minutes after exposure and may be passed on to subsequent generations. The Endocrine Society, 14,000 researchers and medical specialists in more than 100 countries, warned that “even infinitesimally low levels of exposure to endocrine-disrupting chemicals, indeed, any level of exposure at all, may cause endocrine or reproductive abnormalities, particularly if exposure occurs during a critical developmental window. Surprisingly, low doses may even exert more potent effects than higher doses.” If hormone-mimicking chemicals at any level are not safe for a fetus, then the concept is likely to be equally true of the even more intensely toxic radioactive elements drifting over from Japan, some of which may also act as endocrine disruptors. Many epidemiologic studies show that extremely low doses of radiation increase the incidence of childhood cancers, low birth-weight babies, premature births, infant mortality, birth defects and even diminished intelligence. Just two abdominal x-rays delivered to a male can slightly increase the chance of his future children developing leukemia. By damaging proteins anywhere in a living cell, radiation can accelerate the aging process and diminish the function of any organ. Cells can repair themselves, but the rapidly growing cells in a fetus may divide before repair can occur, negating the body’s defense mechanism and replicating the damage. It’s not just humans: scientists have found that animals receiving low doses of radiation from Chernobyl are sick as well. Uninformed commenters (and some industry flacks) claim that we get a higher exposure from background radiation (when we fly, for example) or x-rays then we get from nuclear accidents. In fact, there was exactly zero background radioactive cesium or iodine before above-ground nuclear testing and nuclear accidents started. As such, the concept of “background radiation” is largely a misnomer. Most of the radiation we encounter today – especially the most dangerous types – did not even exist in nature before we built nuclear weapons and reactors. 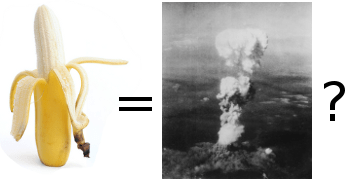 Nuclear apologists pretend that people are exposed to more radiation from bananas than from Fukushima. But unlike low-levels of radioactive potassium found in bananas – which our bodies have adapted to over many years – cesium-137 and iodine 131 are brand new, extremely dangerous substances. The human body is born with potassium-40 [the type of radiation found in bananas] in its tissues and it is the most common radionuclide in human tissues and in food. We evolvedin the presence of potassium-40 and our bodies have well–developed repairmechanisms to respond to its effects. The concentration of potassium-40 in the human body is constant and not affected by concentrations in the environment. The amount of potassium (and therefore of 40K) in the human body is fairly constant because of homeostatsis, so that any excess absorbed from food is quickly compensated by the elimination of an equal amount. It follows that the additional radiation exposure due to eating a banana lasts only for a few hours after ingestion, namely the time it takes for the normal potassium contents of the body to be restored by the kidneys. A lot of things you might not suspect of being radioactive are, including Brazil nuts, and your own body. And this fact is sometimes used to downplay the impact of exposure to radiation via medical treatments or accidental intake. I contacted Geoff Meggitt—a retired health physicist, and former editor of the Journal of Radiological Protection—to find out more. Meggitt worked for the United Kingdom Atomic Energy Authority and its later commercial offshoots for 25 years. He says there’s an enormous variation in the risks associated with swallowing the same amount of different radioactive materials—and even some difference between the same dose, of the same material, but in different chemical forms. 1) The physical characteristics of the radioactivity—i.e, What’s its half-life? Is the radiation emitted alpha, beta or gamma? 2) The way the the radioactivity travels around and is taken up by the body—i.e., How much is absorbed by the blood stream? What tissues does this specific isotope tend to accumulate in? The Potassium-40 in bananas is a particularly poor model isotope to use, Meggitt says, because the potassium content of our bodies seems to be under homeostatic control. When you eat a banana, your body’s level of Potassium-40 doesn’t increase. You just get rid of some excess Potassium-40. The net dose of a banana is zero. And that’s the difference between a useful educational tool and propaganda. (And I say this as somebody who is emphatically not against nuclear energy.) Bananas aren’t really going to give anyone “a more realistic assessment of actual risk”, they’re just going to further distort the picture. Moreover, radioactive particles which end up inside of our lungs or gastrointestinal track, as opposed to radiation which comes to us from outside of our skin are much more dangerous than general exposures to radiation. Risk from internal exposure is 200-600 times greater than risk from external exposure. By way of analogy, external emitters are like dodgeballs being thrown at you. If you get hit, it might hurt. But it’s unlikely you’ll get hit again in the same spot. Internal emitters – on the other hand – are like a black belt martial artist moving in really close and hammering you again and again and again in the exact same spot. That can do real damage. There are few natural high-dose internal emitters. Bananas, brazil nuts and some other foods contain radioactive potassium-40, but in extremely low doses. But – as explained above – our bodies have adapted to handle this type of radiation. In other words, doses are cumulative: the more times someone is exposed, the greater the potential damage. It has been shown that in some cases a synergistic effect results when several organs of the body are irradiated simultaneously. Because different radionuclides accumulate in different parts of the body – e.g. cesium in the muscles, kidneys, heart and liver, iodine in the thyroid, and strontium in the bones – the exposure to many types of radiation may be more dangerous than exposure just to one or two types. As such, adding new radioactive compounds like cesium and iodine into the environment may cause synergistic damage to our health.